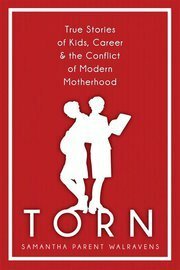 My good friend Meg is starting up a bookclub with some girls and the first book we've decided to read is "Torn: True Stories of Kids, Career and the conflict of Modern Motherhood." It should be a great read something that I know myself and other friends have been conflicted over. I'll let you know how it goes. It was highlighted by The New York Times and I think recently discussed on The Today Show, why not jump on the bandwagon.